I’ve come across an obsolete part for my 240D. The exhaust is broken up into three segments. Mine rotted where the middle section meets the rear. A week or so goes by with this gigantic box sitting in my house until I get the time to work on it. Got it all off in short order. Inspecting rear section: There is no way that is coming out of there. Further inspection: Oh. Guess I’m ordering the rear section too. I called Bosal to see if it is still being manufactured and was told it was discontinued in August and to try the dealer. I sent an e-mail to the parts department of my nearest dealer after not getting through on the phone. About 15 minutes later I get a call and ignore it because I don’t recognize the number. The voicemail is from Karen in sales contacting me to schedule that test drive for that new Mercedes I’m interested in. I don’t like ordering from ebay for the most part but had found a listing that (at the time) showed 5 available. ECS Tuning is the last place I found that shows it in stock, but it doesn’t qualify for their free shipping. $180 for shipping seems a bit much when everywhere else was either free shipping or way cheaper. So I’ve emailed them checking on availability and if that shipping quote is accurate. Hopefully they have it and can do a bit better on that shipping price because I’d rather not go to one of the nearby exhaust shops. 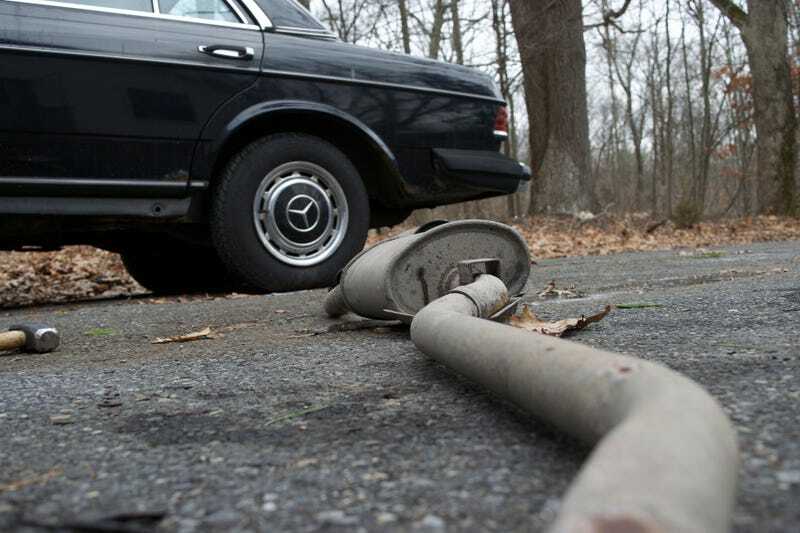 Right now the car sits with just a lonely down pipe. I may have to see what it sounds like with no exhaust.